This 2014 film, originally titled Scintilla is one of the most believable science fiction movies on offer at the moment. Its tale of genetic experimentation and finding DNA on meteorites scattered across Russia which go towards making a human/alien hybrid feels all too real in a time where gene splicing is almost becoming the norm. Directed by Billy O’Brien (Isolation, Ferocious Planet) from a script with no less than five writers, one of whom is the director himself, and starring John Lynch (Black Death, The Secret Garden), Craig Conway (Doomsday, The Stagg Do) and proving that there is life after Misfits, Antonia Thomas. The cast is rounded out by a group of excellent character actors that include Jumayn Hunter from Attack the Block and Eden Lake, who all really help to sell this film’s story. Lynch, who has been a favorite since The Secret Garden plays Powell, a mercenary who is in prison being tortured at the start of the film. He is released to retrieve a scientist who is ensconced in a underground lab. The doctor is busily experimenting on human/alien hybrids and Powell heads up a team, of his old mercenary comrades, to enter the facility. This movie looks brilliant. Resembling a war film rather than a science fiction thriller, which it really is, helps to sell the plot, telekinesis and telepathy included. The hybrids, and the Mole Rats are equally disturbing although the alien/human specimens initially move the viewer more toward pity. Later, those feelings are replaced with a sense of fear as the male gets loose. The director has done a brilliant job of letting his actors run with the roles assigned them. Amusingly, Craig Conway’s character gets something lopped off, reminiscent of his Sol in Doomsday and he actually gets the best line in the film, “iPhone batteries always let you down.” His Mason may spend a good portion of the film silent, but he gets the best, albeit short, character arc of the lot with a great redemption scene as well. Ned Dennehy (Blitz, Sherlock Holmes) as Harris gives a great performance as the chap who seems to be capable of doing it all. A sort of Chief Cook and Bottle Washer who also has a pretty decent arc. Keep an eye on Chris Ellis-Stanton, who plays Williams, this actor has the presence of a young Roger Moore and will no doubt become someone who graces British screens quite a lot in the future. Aiste Gramantaite) with enough attitude to sink a ship, the film, its plot and characters all have a gritty believability that is a pleasure to experience. Do not miss this cracking little film with the big cast and don’t let the hoodie at the end terrify you too much. Written by Dario Poloni (the man who penned the brilliant film Wilderness) and directed by Christopher Smith (Severance, Triangle, Creep) and staring Sean Bean (Black Death,The Lord of the Rings Trilogy), Eddie Redmayne (The Good Shepard, My Week with Marilyn), Carice van Houten (Repo Men, Intruders), John Lynch (The Secret Garden, Sliding Doors), and Tim McInnerny (Severance, Notting Hill). 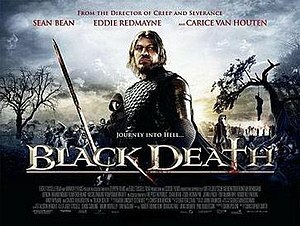 With a pedigree this impressive it seems like Black Death could deliver entertainment in spades and it does. It is an incredibly bleak film for all it’s big name cast and crew. The message that director Smith is apparently sending is that people react the same way to terrible events whether they are in days of ‘olde’ or now. The film opened to positive reviews and Rotten Tomatoes gave it a “certified fresh” rating. But looking at the box office returns from their opening weekend, it appears that audiences did not share the critics feelings about the film. I am assuming that the DVD sales will up their take. Interestingly, neither IMDB nor Wikipedia lists their budget. Set in 1348 in an England being decimated by the plague that was known as the ‘black death’ we see a young monk, Osmond (Redmayne). He resides at a monastery under the tutelage of the Abbot (David Warner) for all things spiritual and for all things of the flesh a young girl named Averil (Kimberley Nixon). When Osmond discovers that the plague has breeched the monastery walls he tells Averill to leave and head for the sanctuary of the nearby forest. Averill does not want to leave Osmond behind and says that she will wait in a clearing every morning for a week for him to follow her. After she leaves a group of men lead by a knight appointed by the Bishop of the Church arrives. The knight Ulrich (Sean Bean) is looking for a village that is rumoured to be free of the plague and of God. The village is worshipping a demon and necromancer and the Church wants this group of ‘holy crusaders’ to kill the demon and necromancer and bring the body to the church. Ulrich asks the Abbot for a volunteer who knows the area to lead them to the village on the other side of the marshes. Osmond, who has been praying for a sign from God, volunteers (much to the Abbot’s dismay) and the group depart. This ‘rag-tag’ group of holy enforcers are grim, battle scarred and, on the surface, not a bit holy. But working on the principle of might makes right, this little ‘God’ squad feel like they are invincible. Only Ulrich appears to be the real deal, a true believer in the Church and God. His right hand man is Wolfstan (John Lynch) and his most ardent supporter is Swire (Emun Elliott). Omond and Ulrich talking theology. When the group reach the edge of the forest they camp for the night. Osmond wakes up before the rest and goes to find Averill. Finding her horse and a trail of bloody clothes instead, he is consumed with grief. While he is clutching the bloody rags, he sees a large group of armed men and he runs back to the camp yelling out a warning. Bloody battle commences and one of the holy group is killed defending Osmond, who is himself wounded, and the remaining group of thieves who attacked the camp steal Ulrich’s horses and ride off. Ulrich forces Osmond to continue leading the group and they cross the marsh. Arriving at the village, they are greeted by Hob (Tim McInnerny) and warmly welcomed. The village’s leader and healer is Langiva (Van Houten) and she treats Osmond’s wound with a miraculous salve that stops his pain almost instantly. Despite the groups suspicions and misgivings they join the villagers in a welcoming feast. Osmond follows Langiva outside where she leads him to a spot in the woods. There she ‘raises’ Averill from the dead for Osmond. He runs away terrified by what he has just witnessed. When he returns to the hall he finds the holy enforcers have been drugged and he is knocked out. The group awaken in a pit of water with their hands tied around poles that stretch across the pit. Langiva tells them that they must repent their God or die. Hob takes one of the men and kills him when he refuses. Swire then says that he will renounce God. Hob removes him and Swire then publicly renounces God. Hob says that he is free to go and that some men will take him to the edge of the village. They do, but Swire will go no further as they kill him anyway. Langvia then removes Osmond from the pit and sends him to a hut that contains Averill. When he enters Averill is coughing and spitting up what looks like blood. She is stabbing a table and the walls with a knife. She is clearly mad and Osmond kills her telling her that they will be together soon. Hob then takes out Ulrich and they tie him to two Punch horses. As the horses start to pull him apart he continues to refuse to repent his God. Before he dies he tells Osmond to open his shirt. Osmond does so and everyone discovers that Ulrich has the black death and he has brought it to the village. Wolfstan and Mold (Johnny Harris) escape the pit and while the villagers are panicking start killing the men of the village. When the carnage ends only Wolfstan and Hob are left alive and Hob has been incarcerated for delivery to the church. Osmond chases after Langvia but loses her in the marshes. Osmond is returned to the monastery and Wolfstan says he never saw him again, but has heard that Osmond became a ‘soldier of God’ and searched for evil. In a short montage we see that Osmond sees Langvia’s face on every woman that he accuses of being a witch and he executes them all. This film is bleak and dark and grim. There are no little breaks from this bleak picture, no humorous let ups at all. Despite this unrelenting attack of the viewer it is a good film. I enjoyed it, if enjoy is the right word to use, and felt that the acting from all was superb. It was wonderful to see David Warner, although it would have been nice to have seen a bit more of him, and it was the first time I’d seen Tim McInnerny since Severance. I was also pleased to see John Lynch again. He is a brilliant actor and I’ve loved his work since The Secret Garden. I will say though that my hat is off to the casting director. 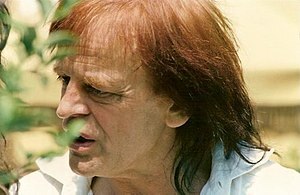 How he managed to find an actor who is almost the spitting image of actor Klaus Kinski is beyond impressive. I checked IMDb and found that the actors name was Tygo Gernandt and even though he seems a bit tall to be a real dead ringer for Kinski, if they ever do a film of his life, Gernandt should play the lead. The cinematography is crisp, clear and mood making. Smith’s direction and the films location all combined to make it work very well. So yes it was bleak, but considering the subject matter, you could hardly expect it to be anything else.